With the growth in cloud storage the way that people access that information also changes. Much access, especially for cloud services, is now undertaken away from a traditional desktop and in many cases on mobile devices. With that in mind Microsoft is again updating its mobile OneDrive apps. One of the enhancements on the Android platform is the ability to access your OneDrive consumer and OneDrive for Office 365 directly from the same app on Android devices. when combined with Office on Android this will make it extremely easy to work with files no matter where you are. Microsoft is crafting the app to ensure that information is easily separated between personal and business. They are also improving access by utilising pin code access. The rapidly improving features of mobile apps are really beginning to shine light on the power of the cloud as they give people access to their information where ever they are, optimized for the screen they are using. If you are not yet using the OneDrive app for your mobile device download and give it a go. I’m pretty sure you won’t look back. If you already have the app key an eye out for the latest round of updates as they look like some major improvements. If you fire up your Office 365 portal and select Sites from the menu bar across the top you now see your Sites home page is now different (see above screen shot). Gone is the old format (above), with the new format doing away with the left hand column (which was basically a picture of the user who was logged in. And really how useful was that?). It now also displays the logo from the individual sites you are following which helps identify these much quicker to users. 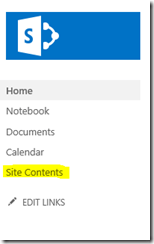 Remember the Sites page is the entry point for many users into all your different Site Collections in SharePoint Online so you should spend the time to make sure it is appealing as possible. This means you should not only add icons for all your sites so they easily identifiable but you should also go in and customise your promoted sites as the top with icons like I have done in the first screen shot above. A much cleaner and simpler interface is always a good thing in my books, so I think update is a good move from Microsoft. What will be next? You can download the free version to see what the product looks like. The free version excludes any downloadable content. The Standard version includes videos streamed from YouTube which may contain advertising. This however, keeps the download size small and reduces the impact on the SharePoint site as well as bandwidth. The Premium version includes the same content as the Standard version but you will receive all the source videos and documents as a separate download. The Premium version permits you to modify this content to suit your business needs. It also permits you to re-brand this content and make it available directly to your customers. Please note you are not permitted to resell or give away this product. There is also an Annual maintenance option that provides 12 months of free upgrades to both the template and content for Premium purchases. This ensures you always have the most recent and up to date version available as Office 365 changes. Finally there is also free version you can download and install, however this version does not contain any content but includes all the links and the structure so it could be used as a starting point to build your own solution. Please note, there is no support provided withe free version. 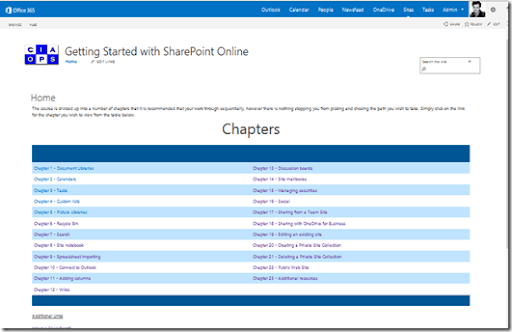 Using this template will provide your business with an easy option to create a learning portal in your SharePoint Online environment. 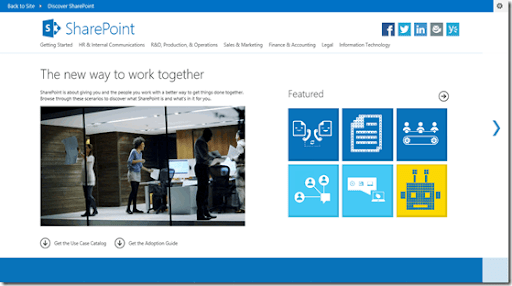 Your users can learn about SharePoint Online while actually using it, which is the best method to achieve fast adoption of the product. I’m making way for a new product to be announced very shortly (if you want an early taste check out my latest videos on YouTube) and as such it is time to clear out the e-commerce store a bit. With that in mind I have decided to make my publication Windows SharePoint Master Class Tutorials available for free download. Look out for my latest product real soon! 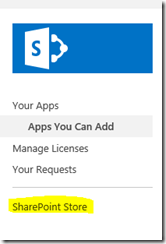 End user adoption in the SMB space is more of a challenge but I get REALLY frustrated when I see resellers ‘implement’ SharePoint Online by simply copying user files to a single Document Library and then running away screaming that there is no opportunity with cloud services. SIGH. 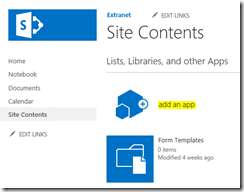 But I’ll bet you didn’t know that you can embed this content directly into a customers SharePoint Team Site. Here’s how. 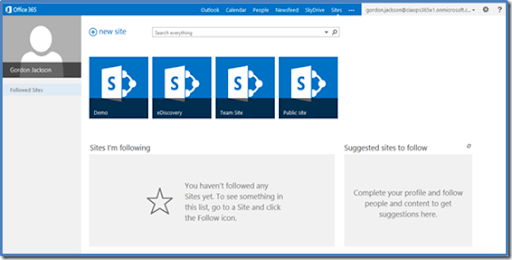 Navigate to a SharePoint Online Team Site. Select Site Contents from the Quick Launch menu on the left. 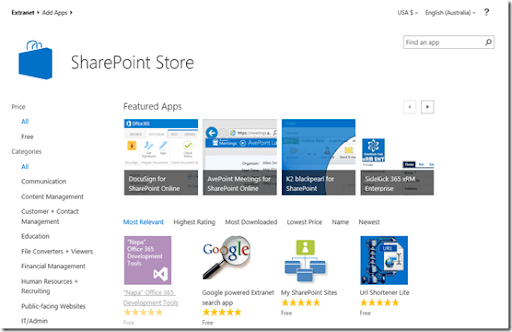 Select SharePoint Store at the bottom of the Quick Launch Menu. If you get this warning select a language in the top right. You should now see the store with apps inside as shown above. Go to the search box in the top right and enter discover and select the magnifying glass to search. 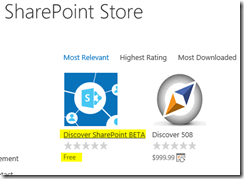 Hopefully the first result should be Discover SharePoint BETA. Select this. This will take you to a screen with more details about the app. Select ADD IT on the right. 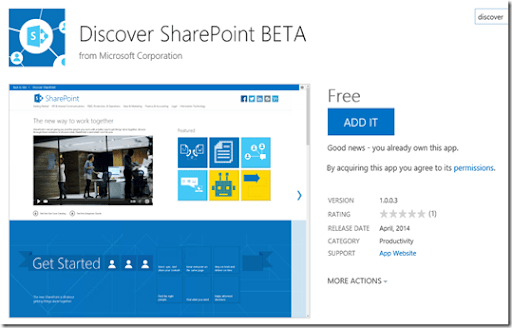 You should now see the Discover SharePoint BETA app listed in the Site Contents. Select this. It will take a moment or two to set up. You should then see the app displayed on the page as shown above. If you select the Cog in the top right of the page you will see a menu as shown above. The Settings option will allow you to determine whether analytics is sent to Microsoft to help improve the product. Note that it is enabled by default. 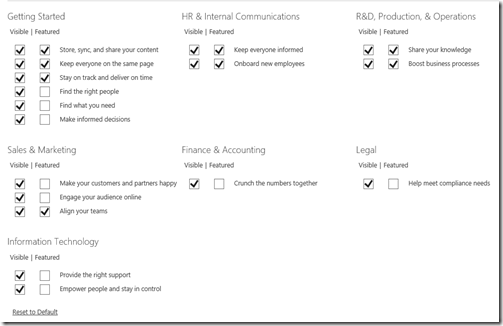 If you select Admin Panel you will be taken to a screen where you can select what content is displayed by the app. Maybe you just want to start simple with a limited amount of information so as to not overload your users, you can de-select what isn’t required initially and then return and add it later when ready. When complete select the Save Changes at the bottom of the page. 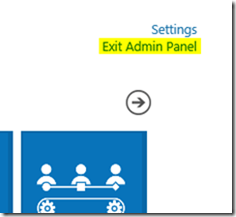 You’ll then need to select Exit Admin Panel in the top right of the page. This will return you to the app. To to return to your Team Site select Back to Site in the top left hand corner of the window. 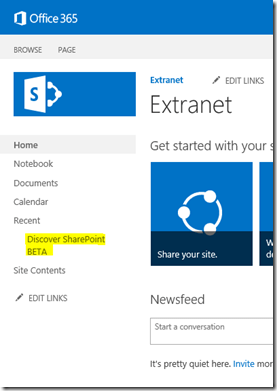 On the Team Site you should now find the Discover SharePoint BETA item listed in Quick Launch Menu allowing anyone to access the app directly. 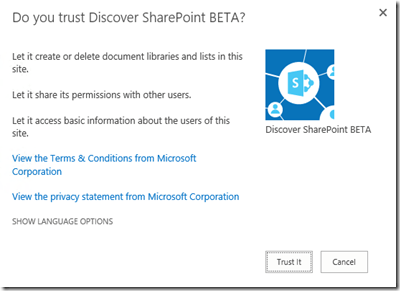 From here the Discover SharePoint BETA is just like any app in SharePoint, you can remove it at anytime if you want. Don’t forget that the content in this app is being updated regularly so continue to visit it to see what’s new. 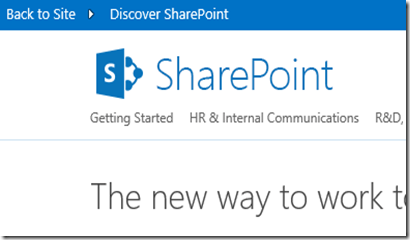 So hopefully, there is a nice simply way for you to add some information and training about SharePoint Online to help end user adoption directly into a Team Site. Microsoft will continue to provide technical support for these via extended support but the message is that you really should look at migrating off these products as soon as you can. Why? Because things like non-security updates will only be available to customers with an extended hotfix agreements and that rules out most smaller customers. The bottom line is that the longer you sit on your current versions of software the less support will be available. This to me, if one of the great benefits of a cloud service like Office 365 that is always up to date and you no longer have to worry about these sorts of issues. So beware that the sands of time continue to march on and much like us all the software you are using now isn’t getting any younger. Azure data centers are coming to Australia! Living in a country with low population density and very poor internet, going to the cloud can be a big challenge at times. What looks fast and responsive on US demos ends up being very substandard here for many reasons. We have known for a while that Azure data centers are coming to Australia and it seems like they are starting to come online as you see from the above graphic. 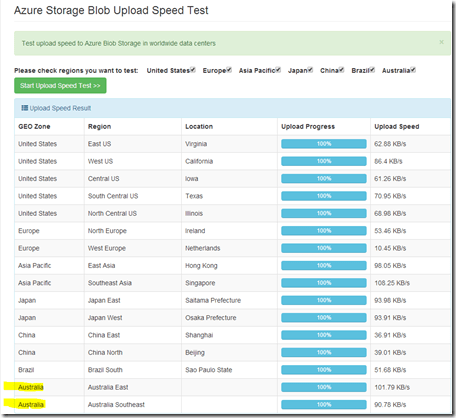 This shows the speed to different Azure data centers and down the bottom of the list now appears Australia! Yeah! 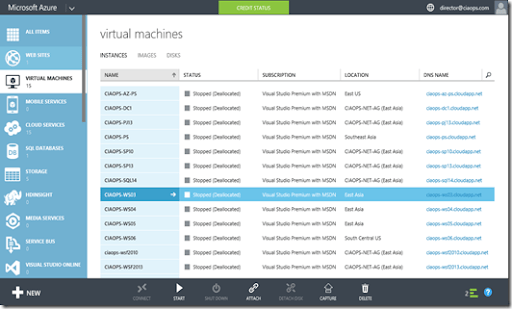 It will be fantastic when these become available via the azure portal for hosting things like Virtual Machines. It’ll be nice to have a piece of the Microsoft cloud in our own backyard for a change. 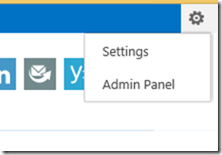 If you create virtual machines in Microsoft Azure, you typically connect to them using RDP (if they are of course Windows machines). What you may not be aware of is the fact that you restrict, or whitelist, which remote IP addresses are allowed to RDP to these machines. Here’s how you configure this. You login to you Microsoft Azure console as shown above. In here is a Windows Domain Controller machine. What I want to do is restrict remote RDP access to this machine for security reasons (since it is a Domain Controller after all). To do that select the Virtual Machine from the list and then the Endpoints option from the menu across the top as shown above. At the moment there are only have two endpoints, one for PowerShell and one for Remote Desktop (i.e. RDP). Both of these services are accessible to the outside world via the Public port (which I have obscured for privacy reasons). These Public ports map to familiar Private ports at the virtual machine. Thus, Remote Desktop connects via a random port from the Internet and this then mapped to the familiar port 3389 port internally at the machine. To set security on an Endpoint, simply select it and then select the MANAGE ACL button at the bottom of the screen. You will then see a dialog that allows you to enter a description as well as a remote subnet. You can then set the action to be either Permit or Deny. With RDP traffic the default is to allow all inbound traffic for that endpoint. All other ports are blocked for inbound traffic unless endpoints are created for those ports. No ACL – By default when an endpoint is created, Azure permits all for the endpoint. Permit – When you add one or more “permit” ranges, you are denying all other ranges by default. Only packets from the permitted IP range will be able to communicate with the virtual machine endpoint. Deny – When you add one or more “deny” ranges, you are permitting all other ranges of traffic by default. Combination of Permit and Deny – You can use a combination of “permit” and “deny” when you want to carve out a specific IP range to be permitted or denied.